In pitch-black waters, with only their hands to guide them, Cambodia’s salvage divers will soon start to recover thousands of tons of unexploded artillery shells and munitions that lie at the bottom of the country’s lakes and rivers. PHNOM PENH, Cambodia — In pitch-black waters, with only their hands to guide them, Cambodia’s salvage divers will soon start to recover thousands of tons of unexploded artillery shells and munitions that lie at the bottom of the country’s lakes and rivers. Before they begin their perilous dives 100 feet below the water's surface, however, the divers must address first things first — learn to swim. On a recent weekday afternoon, 35 volunteer divers stood waist deep in a pool in the capital Phnom Penh, taking swimming lessons. “There is no big tradition of recreational swimming in Cambodia, so we needed a course to teach them everything, from recreational swimming to snorkeling, scuba diving and then salvage diving,” said Allen Tan, a former US Army explosive ordnance disposal expert, who conducted the four-week-long training for US-based NGO Golden West Humanitarian Organization. More than 20 years after the Khmer Rouge regime, under which 2 million Cambodians perished, and the following civil war left the country littered with mines and unexploded ordnance, it still remains one of the most heavily mined regions. Tan estimates that a potential of 300 ships were sunk in Cambodia’s Mekong and Tonle Sap rivers in the 1960s and '70s, when the former regime received US supplies from South Vietnam before being toppled by the Khmer Rouge. “These barges are filled with ordnance and are just sitting on the bottom of the river. It’s big security problem. If someone were to find them and take them out, no one will realize its missing — so it’s this big, unsecured stockpile,” Tan said. Some of the American barges were filled with up to 1,000 tons of munitions, which, if recovered, could still be used today and sold by anyone hoping to make a profit. “The ordnance could be used for illegal quarrying or dynamite fishing, or it could be transported through villages to sell it on the black market. It’s a regional security risk,” Tan said, adding that it could also be used for terrorism — part of the reason why the US office of Weapons Removal and Abatement funded the project. “Anything they are going to do with the ordnance — it is not good,” Tan said. The training, which wrapped up recently, started with 35 volunteers from the Cambodian Mine Action Center, the country’s national demining unit. For most of the volunteers, the incentives were the challenges of learning how to swim and dive, plus a pay rise for everyone who made it through the rigorous training. Not much was required of the volunteers, besides good personal health, and the men who showed up for the first swimming classes ranged in age, shape and experience. “Most of them had never put their faces under water,” Tan said, before the strict daily schedule began. 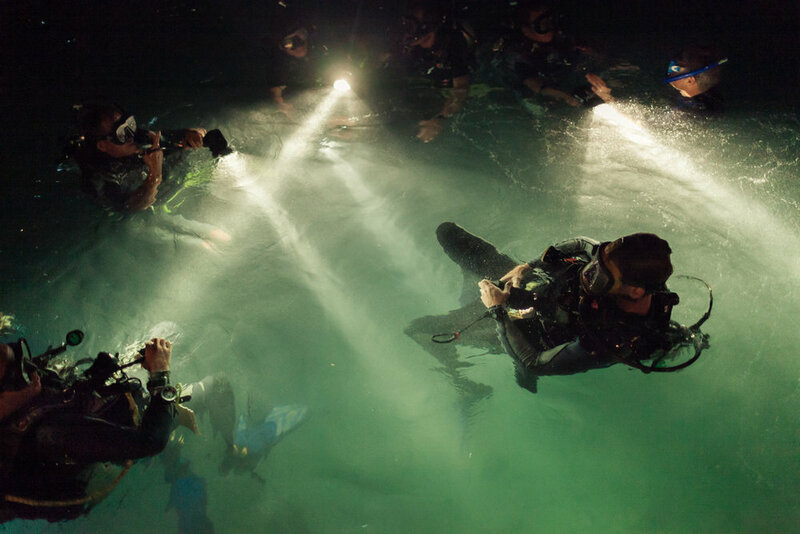 Former US Army explosive ordnance disposal specialists and divers trained the group in a boot camp style and the “correctional exercises” left students who didn’t follow instructions out of breath. Medical conditions and a lack of strength and stamina forced some to give in, while others could not live up to what was expected academically. But for 40-year-old deminer Tri Khun, one of the best in the class, this was not an option. “Some things are very difficult, like the things we learn in the class rooms. But I actually enjoy the swimming, and I always wanted to know how to swim,” he said. Only 20 could make it to the second phase of the training on the white sand beaches on the Gulf of Thailand, where the group learned snorkeling, scuba diving and, eventually, military diving. “What I’m looking for in these guys is can they stay calm and can they be taught. This work can be extremely scary, especially because there will be zero visibility in the Mekong — everything’s done by touch,” said Robert Rice, a former US navy explosive ordnance disposal diver with more than 20 years experience and one of the lead instructors on the project. By the third week of the course, the group of students — by this point cut back to 15 — was sitting on a double-decker boat a few miles off the coast of the southern Cambodian tourist destination Sihanoukville as they listened to instructions for their first military dive. In the space of three weeks they had gone from novice swimmers to certified scuba divers. Although the daily push-ups and the long swims in the Gulf of Thailand were strenuous, studying the laws of physics — knowledge needed for scuba diving — was the most difficult part, the soft-spoken Khun said. "I am very old and my memory is not so good, so the lessons in the classroom were very difficult to understand and remember. I had to study really hard, sometimes even until 11 pm," he said. For Gerard Leelan, director of Sihanoukville's Scuba Nation dive center and one of the program's diving instructors who usually teach American and European tourists, teaching this particular group came with its own set of challenges. Conveying the notions of density, weightlessness and pressure are complex concepts that had to be understood. "Usually I say that diving is like being an astronaut because of the weightlessness. I'm a big guy, but if I'm under the water, that doesn't matter," Leelan said as an example of one of his classes. "But then I found out that they don't know what an astronaut is, so the translator had to explain what astronaut means first," he laughed. With days starting at 6 a.m. and ending at 11 p.m., students and instructors were pushed to their limits. Sometimes, they even conducted exercises in the middle of the night. "But these guys, they volunteered to do this, and if they want to do it then we have to support them," he said. "They are worth it." Indeed, the ordnance buried in Cambodia's waterways is a security risk to fishermen and can also be a burden to authorities hoping to build bridges. The many hours spent in pools in Phnom Penh and in classrooms tying knot after knot were a necessary preparation for what awaits the divers, Tan said. "This evening we will put them into black-out masks for the first time, and their mission will be to find something under water," Tan said ahead of one of the last classes. A few days later, Khun was among the 10 men who graduated from the program. "I'm so happy that I can be part of this first generation of divers. I wasn't sure if I could make it through each step of the program, some things were very difficult," Khun said after the graduation ceremony in Phnom Penh. He is now capable of submerging himself in the pitch-black waters of Cambodia's rivers to find bombs, grenades and other munitions, but is still waiting to receive further training from US Army salvage divers. Their first task will be in shallow waters, where locals are more prone to look for ordnance. "We will pick the low-hanging fruits first because we are trying to get there before the scrapers and the scrapers are trying to do the same, so it's like a chess game," Tan said. With more experience, the divers could then also demine deep and fast flowing parts of the Mekong such as in Prey Veng province's Neak Loeung, where heavy contamination by unexploded ordnance is a problem and hinders development of irrigation systems and bridges. "It will get more difficult, but I'm looking forward to this and I think we will be ready,” Khun said. "I became a deminer to make this country safe, and now I want to clear the rivers too," he said.